Did you folks know I’ve never, ever done a crochet-a-long before? Ever? Well, that changed at the beginning of January – and I’m having a lot of fun with it. For those curious, I’m taking part in the Woodland Blanket Crochet-a-Long, led by Lucy of Attic24. Kasi suggested we do the crochet-a-long together, and so we bought the yarn in December and waited. 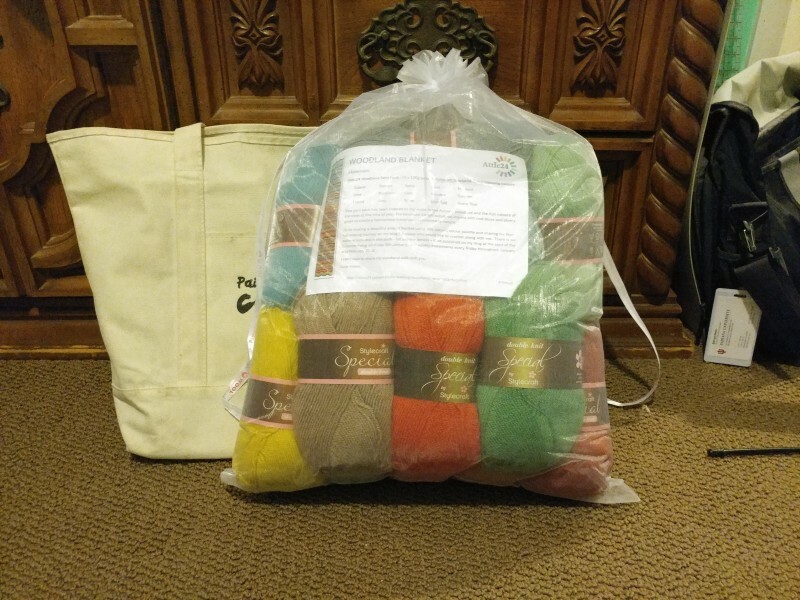 This bag of yarn taunted me for weeks. And on January 5th, the Woodland Blanket crochet-a-long started! And I did a first for me – I made a gauge swatch before jumping headlong into a blanket. And it was exactly the size it needed to be! I was ridiculously excited that the gauge swatch turned out exactly as it should – and I jumped right in after that, and crocheted until my wrist hurt. It’s been a while since I crocheted anything, what with my recent obsession with sock making, hah, and my wrist was out of practice. Steve’s been really enjoying me crocheting, too. 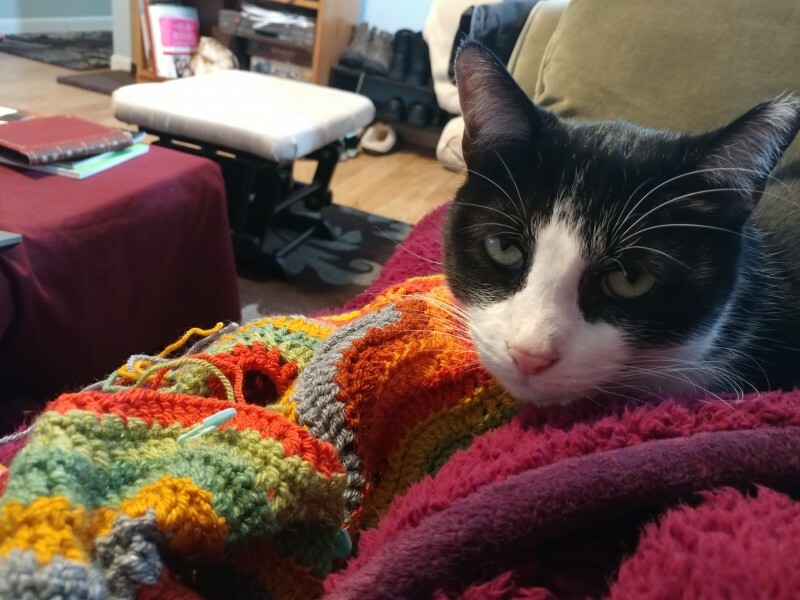 A warm human, sitting still for hours while making a thing to snuggle under? Count him in. I think he’s already claimed the blanket as his own. 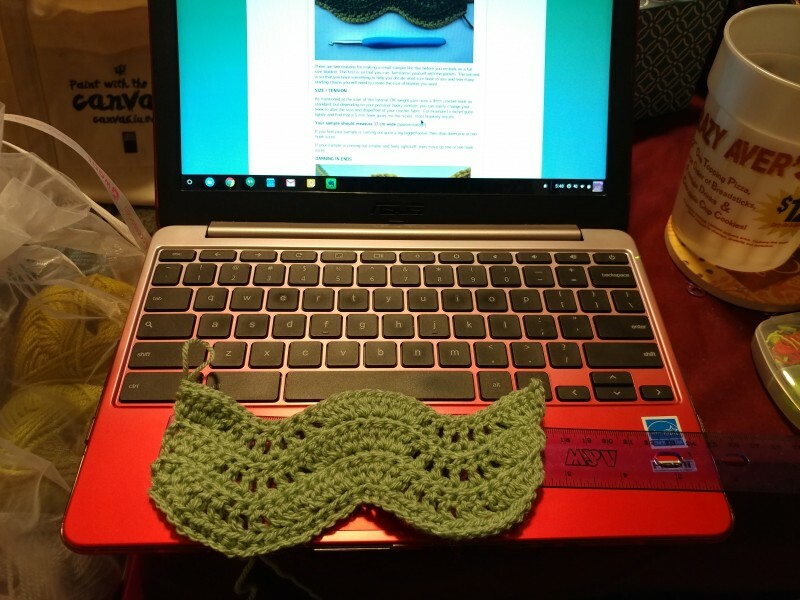 And I’ll admit, instead of writing blog posts, I’ve been crocheting furiously and hanging out around the Facebook group for the crochet-a-long. 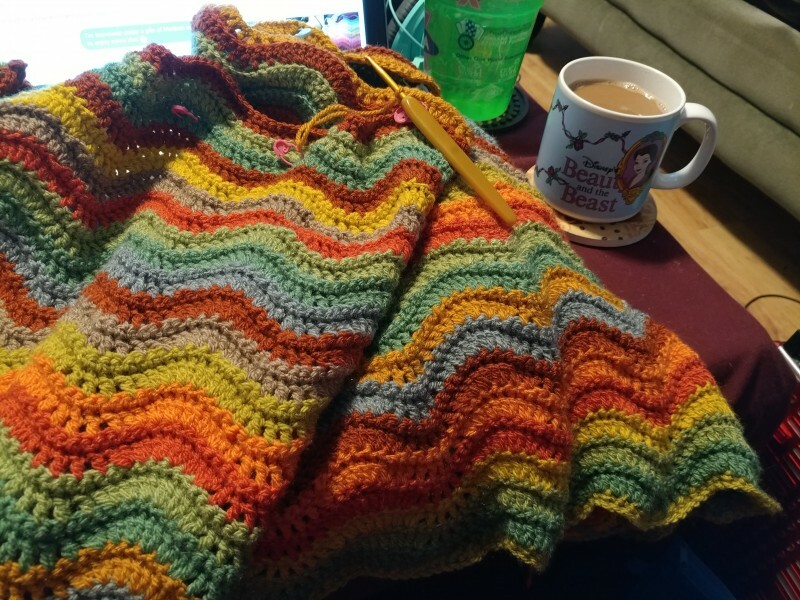 There are so many pretty blankets being showed off there, and I love seeing all the different ways people are working with the colors and following their own path through the crochet-a-long. It’s almost addicting, working on the blanket and looking at others’ blankets as they’re in progress. The pattern for this blanket has a nice rhythm to it, and the colors we’ve all been working with the past few weeks are delightfully warm and have really brightened up the recent string of snow days I’ve had. The best thing to do on a snow day: crochet and drink chai. I’ll post about the blanket again closer to when it’s finished, so I don’t end up overwhelming everyone with blanket posts like I’ve been doing on Instagram. It’s been a great project to unwind with when I get home from work. Especially on days like today, when I had one of the least pleasant commutes home ever – I’m so tempted to hibernate until all the snow melts. Driving in snow is scary. Crocheting is not.